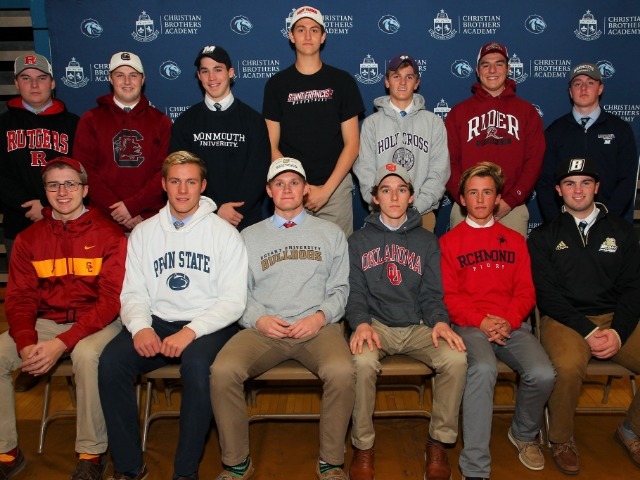 Thirteen Christian Brothers Academy student-athletes officially made their commitments to Division I colleges across the country on Wednesday afternoon. The group of 13 students have won multiple state, conference and division titles during their time as Colts. Crochet and Reid recently helped CBA Cross Country win both the state and Shore Conference championships over the past month. The trio of swimmers, Burke, Retterer and Rennard, have been two-time state champions and three-time Shore Conference champions in their three years on the team. Hansen and Wall have helped the golf team win back-to-back NJSIAA Tournament of Champions, making the Colts the best team in New Jersey. Wall became the first CBA golfer to achieve the “grand slam” last spring, winning the county, conference, state sectional and state championship individual titles. Lacrosse’s Gray and Macrae will head to Monmouth University as teammates once again, after playing big roles on the state runner-up CBA team last spring. Nelson has been a leader on the CBA tennis team, which has won the South Jersey sectional championships each of the last two spring seasons. Finally, Cohen will play basketball at St. Francis, where he will bring his double-double capability to the Northeast Conference. CBA will hold an additional signing day in April when the “regular” commitment period begins.